In the summer of 1928 made his first trip to the Netherlands to see paintings by his beloved Dutch Golden Age masters, Jan Steen and Johannes Vermeer. "I loved that way the Dutch painters have of bringing out minute details like specks of dust and concentrating attention on a tiny spark in the darkness," Miro once remarked. "This is where their great power to fascinate lies." Dutch Interior I is based on a seventeenth - century painting by Hendrick Martensz Sorgh depicting a lute player in a domestic interior. Miro bought a postcard reproduction of the work at the Rijksmuseum in Amsterdam a few months prior to beginning his painting. 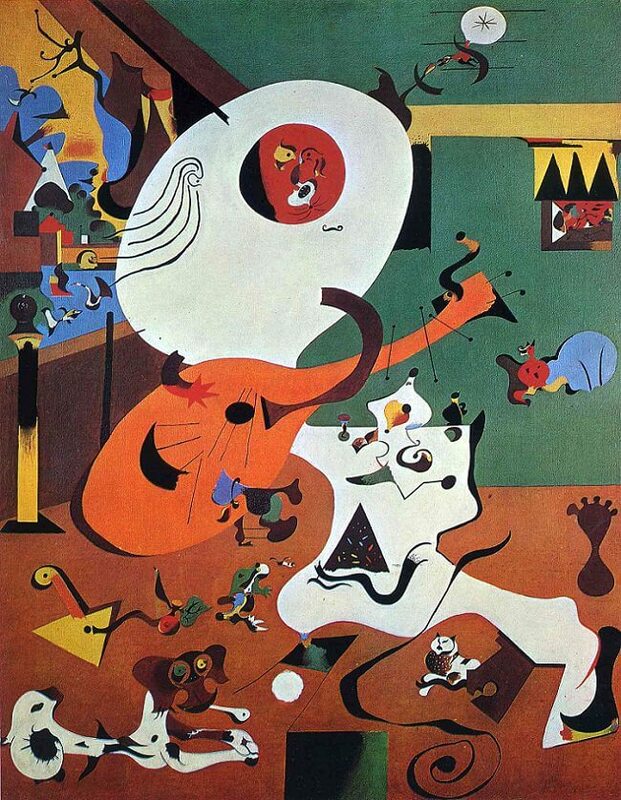 Joan Miro and his contemporaries were encouraged by the doctrines of Sigmund Freud to make extensive experiments in deliberately suspending conscious control in order to release an unhindered flow of unconscious thought. They actually influenced states of hallucination, risking madness in order to capture the shapes and figures on paper during these states. Miro's Dutch Interior I shows the very basic form of a man playing a guitar. He is the main focus with a dog, cat, pictures on the wall, and a window that the man is leaned up against. The man's body is a huge white blob with no definite separation to any body part. Starting from the top of the body, the head has a red circle at the top that represents the brain and holds the eyes and mouth. The eyes are two bird like figures that face each other while the mouth is another bird like figure that has white teeth coming from all directions. The ears are less recognizable: the right has the most ear-like shape while the left ear resembles an antenna. The left side has the same arm, although the hand is just a triangle. The white man figure has one leg that comes down his body but two feet that are sitting out from his body.